WASHINGTON, D.C. -- Americans are feeling a bit more cautious about holiday gift-buying today than they were a month ago, as evidenced by their estimated spending on Christmas gifts. That figure has fallen to $794, from $885 in October. Today's figure is also down from $862 last year at this time, but consumer spending intentions remain high enough to suggest it will be a reasonably good holiday season for retailers, if not the banner year suggested by last month's figure. The latest results are based on a Gallup telephone poll conducted Nov. 1-11 with a nationally representative sample of 1,037 U.S. adults, aged 18 and older. Although Americans' Christmas spending estimate is down from last year, it is highly unlikely that actual retail spending during the holiday season will be lower. That is a rarity seen mostly during challenging economic times, such as in 2008 during the financial crisis and Great Recession. Rather, Gallup modeling of how this measure has related to retail sales historically suggests spending is most likely to increase by between 2% and 4%. The $794 spending mean reflects the finding that 32% of Americans plan to spend at least $1,000 on Christmas gifts, 21% will spend between $500 and $999, 29% will spend between $100 and $499, and 2% will spend less than $100. 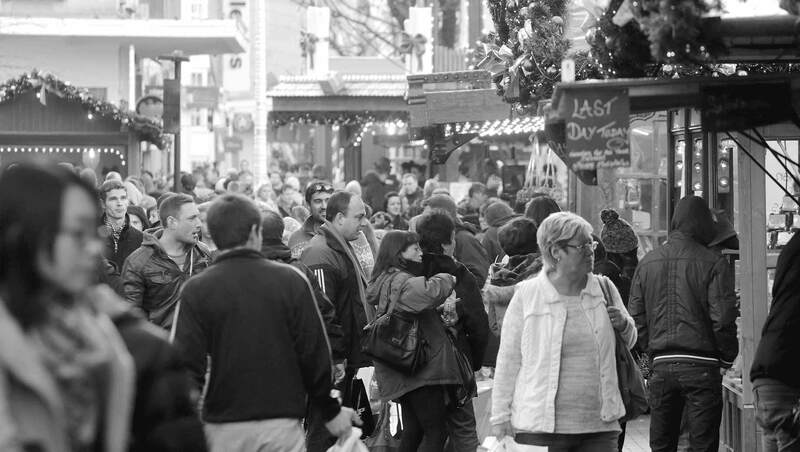 Roughly one in 10, including those who say they don't celebrate Christmas, report they will spend nothing, while 6% are unsure what they will spend. The decline since October in Americans' forecasted holiday spending may reflect a recurring cold-feet syndrome seen in the Gallup trend. 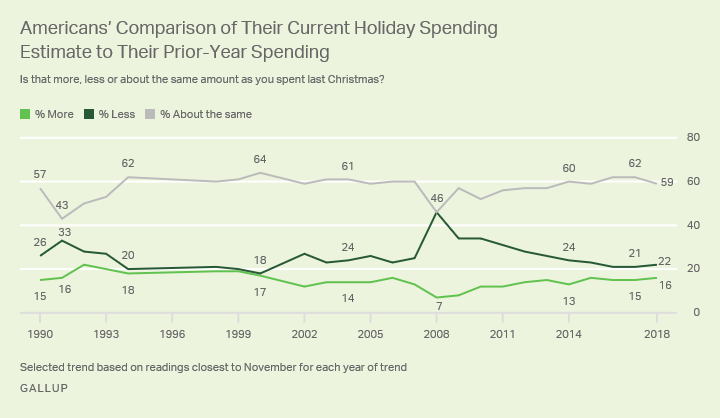 In eight of the 11 years from 2006-2017 when Gallup measured holiday spending intentions in both October and November, consumers' spending estimates fell by more than $30 between the two measures. This year's $91 difference is one of the steeper mid-season declines, exceeded only by a $185 drop that occurred in 2008, as the Wall Street financial crisis was unfolding, and a $102 drop in 2009 during the 2007-2009 recession. One specific factor potentially depressing consumer holiday spending intentions in November compared with last month could be the ongoing stock market volatility. The Dow Jones Industrial Average was down 5% in October before recovering slightly at the start of November, with even steeper declines seen in other indices. Perhaps aligned with this, projected spending is down the most among higher-income Americans -- those who would be most affected by stock market losses. But spending intentions also fell among the lowest-income group -- people who, given their more limited stock investments, should not be as directly affected by a market decline. A separate measure in the poll asks Americans to say whether the amount they plan to spend on gifts is more, less or the same as what they spent the year prior. Currently, 22% of Americans say they will be spending less on Christmas gifts this year than in 2017 -- a relatively low figure for this sentiment, given the November range from 18% to 46% seen over the years. The largest segment, 59%, say they will spend about the same amount, while 16% say they will spend more. Gallup analysis comparing these results to annual retail sales each year finds a fairly strong correlation between actual spending and the net percentage planning to spend less rather than more. The implications for this year are highly positive, suggesting sales growth of up to 6%. 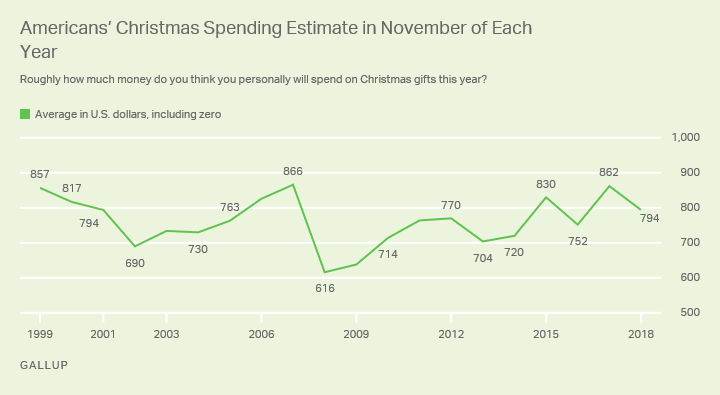 Americans' projection of how much they will spend on gifts this season is down from a month ago and lower than last year at this time, but it's still on par with or higher than their November spending projections in most post-recession years since 2009. On this basis, it appears from the historical pattern that holiday spending will be up modestly. At the same time, relatively few Americans say they will be spending less on gifts this year than the year prior, and analysis of previous years' data suggests this points to somewhat more robust spending. Which way the retail season goes may partly depend on the performance of the stock market in the coming weeks. A strong surge may boost upper-income Americans' comfort with splurging on gifts, whereas continued volatility may dampen their desire to spend even further. Consumer reaction to retailers' sales and final marketing push starting with Thanksgiving week will also be crucial. Results for this Gallup poll are based on telephone interviews conducted Nov. 1-11, 2018, with a random sample of 1,037 adults, aged 18 and older, living in all 50 U.S. states and the District of Columbia. For results based on the total sample of national adults, the margin of sampling error is ±4 percentage points at the 95% confidence level. The margin of sampling error for the spending estimate is ±63 U.S. dollars. 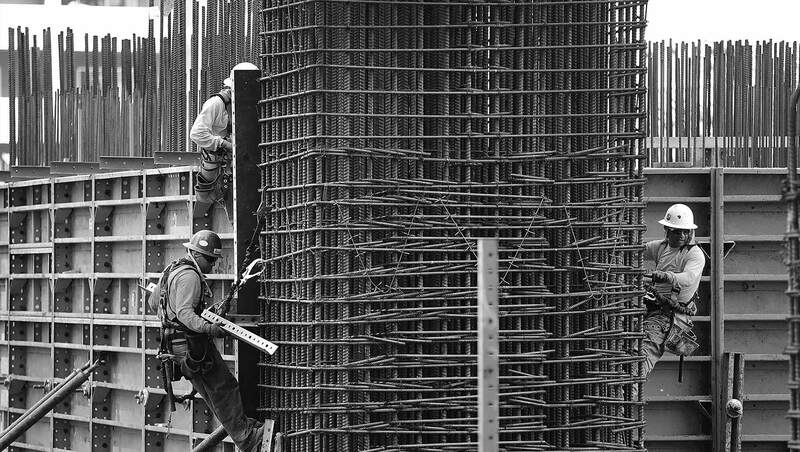 Americans' confidence in the economy has not been higher since 2000, and their assessment of the job market is the most positive it has been in Gallup's 17-year trend. American workers continue to express low levels of worry about being laid off and are overwhelmingly satisfied with their job security. Gallup's initial 2018 estimate of Americans' holiday spending intentions suggests the retail season could approach last year's banner level.